Slaughtneil set up an All-Ireland Club SFC final against Corofin as they came from five points down to beat Austin Stacks 1-14 to 2-10 at Portlaoise. 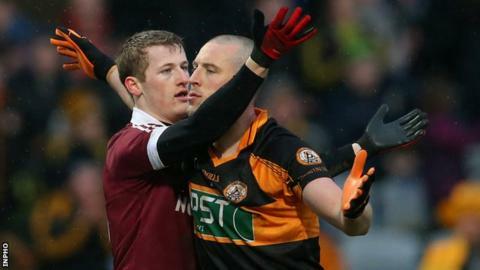 The Derry side led 0-4 to 0-2 but two Pa McCarthy penalties helped Austin Stacks move 2-4 to 0-5 ahead as Kieran Donaghy started to wreak havoc. However, Barry McGuigan's goal helped Slaughtneil draw level by half-time. Austin Stacks moved two ahead again after the break but Cormac O'Doherty's late point sealed Slaughtneil's win. The win may have come at something of a cost to Slaughtneil as impressive forward Christopher Bradley sustained a suspected broken collarbone late in the game and is now a doubt for the final on St Patrick's Day. Midfielder Patsy Bradley produced a magnificent display for Slaughtneil which included scoring a first-half point. McGuigan, Paul Bradley, Padraig Kelly and Gerard Bradley were also among Slaughtneil's stars while Chrissy McKaigue regrouped from his early struggles against Donaghy to produce a strong second half. With Donaghy tormenting McKaigue early on, Slaughtneil manager Mickey Moran opted to switch Brendan Rodgers to mark the Stacks dangerman for the remainder of the game. Admittedly, the supply of ball to Donaghy was reduced during the rest of the contest but Rodgers still did a fine marking job on the All-Star. The Munster champions led 0-2 to 0-0 after points from Shane Carroll and McCarthy but Slaughtneil responded with four unanswered scores including two from Paul Bradley. However, Stacks then hit 2-1 in a five-minute period as the high ball into the towering Donaghy started to bear fruit as both fouls were committed by McKaigue. McCarthy slotted from the rebound after Anton McMullan had saved his poorly-struck penalty but hammered his second spot-kick to the net three minutes later after McKaigue had appeared fortunate to avoid a black card for his foul on Donaghy. However from looking in trouble at 2-4 to 0-5 down, Slaughtneil responded with an unanswered 1-3 as Patsy Bradley's midfield brilliance helped them get right back into the contest. McGuigan's brilliant goal - after he exchanged passes with the midfielder - put them ahead although Carroll's point left the sides level at 2-5 to 1-8 by the break. Stacks hit three of the first four scores after the resumption to move two ahead only for Slaughtneil to get on terms once more thanks to Gerard Bradley and Christopher Bradley points. Both teams swapped the lead over the next 10 minutes before O'Doherty hit what proved to be the winning score with four minutes of normal time left. Extra-time looked on the cards as Carroll was presented with a free from a reasonably central position on the 21 in the closing seconds of normal time but his previously impeccable place kicking form was to desert him. At the finish, Slaughtneil joy was unconfined while the Austin Stacks mood was one of utter desolation.